HP OfficeJet Pro 6975 is a multipurpose printer with physical dimensions of 22.8 x 46.3 x 39.0 cm and 8.1 Kg weight. 2.65” colour LED display allows easy navigation for performing any task directly from the printer, without turning on your PC. It is backed with various connectivity options for seamless printing, including wired and wireless connections. Moreover, one can easily print from their smartphones using Apple AirPrint, the HP Smart app, and other mobile printing programs. The HP Smart App allows printing from the smartphone's camera roll, cloud, or social media. Over the top, one can even print without a network connection via Wi-Fi Direct which connect smart devices with the printer for quick printing. The printer uses 4 HP OfficeJet Pro 6975 ink cartridges which are designed to provide professional-quality prints. One has to replace only the expended ink cartridges, this, in turn, reduces the maintenance cost. Furthermore, the printer has the optimum printing speed of 20 ppm and 11 ppm for grayscale and colour printouts respectively. The printer falls under energy efficient printer as it is energy star certified. 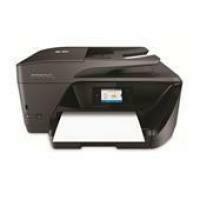 HP OfficeJet Pro 6975 printer is a multifunctional printer which can print, scan, copy and fax the document. The printer is versatile with multiple connectivity options, which makes the printing process trouble-free. One can rely on this printer for a business quality print, for small office or home projects. My HP OfficeJet Pro 6975 All-in-One printer does not print and displays “Cartridges in wrong slot” error message. How can I resolve the message? Step 1: Make sure that you use correct HP OfficeJet Pro 6975 ink cartridges for your HP printer. Step 2: Make sure that the ink cartridges are inserted properly / properly seated in the carriage. Turn on the machine and open ink cartridge access door. The carriage will move to the left side of the printer. Before you proceed, wait until the printer is idle and silent. The color-coded icon on each HP OfficeJet Pro 6975 ink cartridges label should match the color-coded icon on the carriage slot. If they do not match, remove the ink cartridge immediately and insert it in the right slot. To check for any unseated cartridges in the carriage, move your finger slightly along the top of the ink cartridges. Press down any ink cartridge that is higher than the others to rigidly snap it into its slot. If the ink cartridge does not snap into its place, remove the ink cartridge from the carriage and close the ink cartridge access door. Step 3: Remove the HP OfficeJet Pro 6975 ink cartridges and clean them. Clean printhead contacts and then reinstall the ink cartridges into the machine. Step 4: If the printer is not already on, turn it on. Before you continue, wait until the printer is idle and silent. Keep the printer turned on and disconnect the power cord from the rear. Wait for approx 60 seconds and plug the power cord back into the wall outlet. Reconnect the cord to the back of the printer. Power on the HP printer, if it does not automatically turn on. Step 5: If the error message still displays, make sure you don’t have defective cartridge or printhead. Step 6: If the above-mentioned steps do not resolve the error message, service or replace your HP printer. Q. Can I take a print directly from a USB flash drive using the HP OfficeJet Pro 6975 All-in-One printer? A. Yes, you can directly take a print out directly from a USB flash drive. Q. Is it necessary to use original HP OfficeJet Pro 6975 ink cartridges for my printer? A. It is not necessary for you to use original ink cartridges for your printer. You can easily use compatible ones also. The only major difference between compatible ones and original ones is the difference in price. Both compatible and original ink cartridges produce the same quality of output. In fact, it is a better option to use compatible ink cartridges. They are more environment friendly and cost much less without affecting the quality of the print outs. Q. I am thinking to purchase your compatible HP OfficeJet Pro 6975 ink cartridges in bulk. Do you recommend bulk purchase or is there a risk of the cartridges drying up? A. Yes, you can purchase these items in bulk. You can avoid the risk of drying up of ink cartridges by making sure that they are stored correctly in a cool and dry place. They should also be used before the expiry date printed on them. Q. How can I check the amount of ink remaining in the HP OfficeJet Pro 6975 ink cartridges without using the computer? A. To check the ink level from the printer control panel, touch or swipe down the tab at the top of the screen to open the dashboard, and then touch Ink icon. Q. Does the HP OfficeJet Pro 6975 All-in-One printer support automatic duplex printing? A. Yes, the function of automatic duplex printing is available with this printer. Q. What are the dimensions of the HP OfficeJet Pro 6975 All-in-One printer? How much does it weigh? A. The dimensions of this printer are:- 18.3 in (Width) x 15.4 in (Depth) x 9 in (Height). Its weight is around 8.1 kg.